Today’s #BlackExcellenceMonth post will be a special one. Since I know everyone is all worked up over Valentine’s Day (Michelle O hasn’t yet responded to my request for her to be my Valentine that I put in in ’09 but it’s just a matter of time), I wanted to give you guys something special. One of my favorite love stories in Black History, and simultaneously a story of fighting racism and finding Black Excellence. You guys have probably all seen Red Tails. And you know what I think about it. One of the main reasons I didn’t like it was because the real life stories around it were so rich and so deserving of a GOOD vessel to tell them. This is one of them. You probably didn’t know that the film was built on a fairly flexible interpretation of events and people. The characters by and large are fictional, and pastiches of major characters in the long history of Tuskegee Airmen. However, the character played by Bubbles from the Wire was actually based on an adviser of the film, a man whose awesomeness far outstripped that of Bubbles. The real-life man goes by the name of Herbert Carter. And his story by itself is pretty cool. Carter was one of the original Tuskegee Airmen, and had one of the most distinguished careers among them, earning the rare distinction of being both a fighter pilot and the squadron maintenance chief. He flew in 77 combat missions, and is still an ambassador for the Airmen at age 94. But this isn’t just about Herbert Carter. It’s about his love story with a woman; a woman who never flew a mission but one who he considers a better pilot and a Tuskegee Airman. Herbert Carter met Mildred Hemmons in 1939 in Tuskegee when he was in the then-Tuskegee Boarding school and she was in college. He didn’t approach her although they had awkward run-ins from time to time because he felt like he was beneath her station. He was a son of poor Mississippi parents who had never been outside Mississippi until he went to Tuskegee. She was the result of a union between a white man and a Black woman, both of considerable influence, who entered college at the age of 15. They didn’t seem to even be in the same world as each other. However, everything changed when Herbert, ironically in a move to dodge the draft for WWII, joined the Civilian Pilot Training Program at Tuskegee, which was a predecessor organization for the Tuskegee Airmen. In the CPTP he found out that Mildred was also learning how to fly. They began dating seriously. 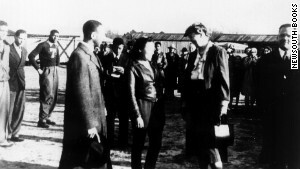 She trained under legendary CPTP instructor “Chief” Anderson, who later would fly Eleanor Roosevelt on the trip that gave the CPTP a massive boost and kick-started the formation of the Tuskegee Airmen. Mildred Hemmons became the first Black woman in Alabama to earn her pilot’s license in 1941. When the 99th Pursuit Squadron, what we now know as the founding Tuskegee Airmen unit, was established in Tuskegee in March of 1941 and Herbert Carter was recruited into it, Mildred Hemmons was the very first civilian hired to work in the project…as a tree bulldozer. She was known as a tomboy around the facilities, and she gained her nickname of “Mike” because she wore the same exact aviator gear as the male pilots. Instead of going out on dates, Herbert and Mildred would meet in the air on weekends, him flying his fighter plane and her flying a much slower Piper J-3 Cub plane. Their way of talking, of flirting, were little aerial maneuvers and blown kisses between cockpits. Herbert acknowledged that while he had the better plane, Mildred was always the better natural pilot. Before the Airmen shipped out to their overseas assignment in 1943, Mildred applied to be a member of the all-women military support group the Women Airforce Service Pilots (the WASPs) but was denied in a swift rejection letter explicitly because of her race. It still strikes me as crazy how so many people were denied the opportunity to VOLUNTEER to sacrifice for this country. The incident brought them closer together, and by the end of 1942, Herbert Carter used all the $175 he had saved up to buy her engagement and wedding rings and the two were married before he left for war. He painted “Mike” on the nose of his plane. 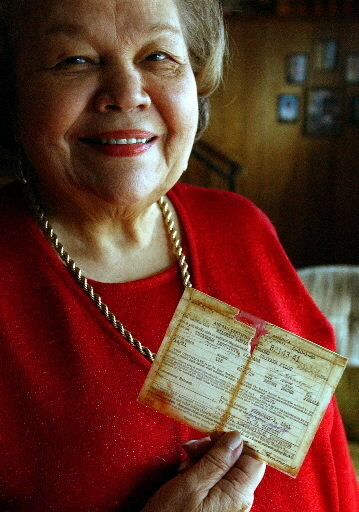 Mildred Carter was ecstatic about going to see Red Tails when it premiered early this year, especially after waiting so long for it to be released. However, in a tragic twist of fate, she passed away in October last year, just a few months before Red Tails premiered. She was 90, and she made her husband promise that he would see the film and live to be 100. He saw the film and continues to endeavor toward his promise of living to be 100. Just six years left. And he continues to say how the best moments of his life were serving as Mike’s wingman. And that’s the story for today. Happy Black Excellence Month. Enjoy your history. There are stories everywhere like this one, but untold. Find them. And Happy Valentine’s Day. Those of you with S/O’s enjoy flying high.